On a not so recent trip back to the St. Louis area I picked up the first four beers in the "Smokestack Series" from Boulevard Brewing. Boulevard is a Kansas City brewery whose beers aren't yet in Indiana; If you looked back to our November 14, 2008 Random Beer Roundup, you'd see that World Class Beverages had announced that we'll be seeing the Smokestack Series of beers in Indiana some time this year. Well, as it turns out, that's on hold. Sadly, we are still waiting on Boulevard. It's not that uncommon in the craft business, especially in these days when most decent breweries are able to sell everything they make, that a brewery has the best intentions of being in new states but doesn't quite make it on any real tight schedule. 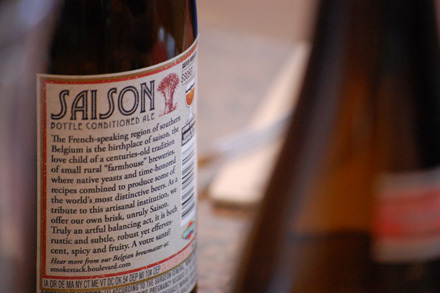 I'd love to get some Saison Brett for myself, but I might have to drive out to Missouri to get it! Still in discussion but maybe this summer. More recently, our own Rod and Jess took a trip to St. Louis to celebrate Jess' birthday. 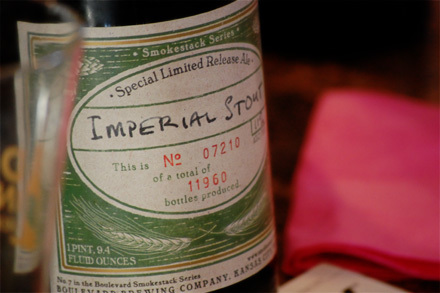 While they were in town they visited Randall's Spirits and picked up a few Smokestack bottles of their own, including one of the newer beers in the series, the Imperial Stout. Having acquired 5 of the 8 beers currently produced (missing only the Saison-Brett and the Bourbon Barrel Quad), we decided it was time to rid them finally and forever from the top of my kitchen cabinets, where they have been (improperly) stored since being acquired sometime after April of 2008. 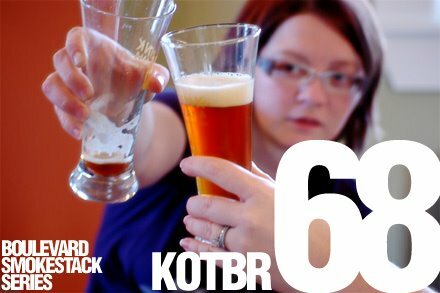 We headed to Rod and Jess' for a little homebrewing and a Knights of the Beer Roundtable. I've never been in a trailer park, but the Double-Wide IPA makes me want to visit someday. This double IPA pours copper in color with a clear, nice light tan head. You catch a hoppy, piney aroma that is sticky sweet. It makes me think of a sugary, sticky, sweet fruit pie cooling next to a big pan of hot-dish (or at least that's what I assume they eat in trailer parks - I've lived in the midwest my whole life and haven't heard anyone refer to a casserole as hot-dish). The taste is syrupy sweet, much like green fla-vor-ice and has a nice spicy kick to the back of the palate. There's notes of tropical fruit, juicy fruit gum and almost a hint of belgian candi sugar. When I drink this beer I am transported to a twister of taste and all I can think of is that Mabel still has my casserole dish. I give it 4.8 mugs and find myself craving more. I got a smokestack full of black beans so get back. Boulevard's Imperial Stout ($11.99/22oz.) is quite a treat. This rendition of an Imperial Stout is not quite as heavy as you would expect. Still a bit warm on alcohol, this stout is very creamy. Coffee and baker's chocolate and prominent in the nose, as you would expect. The flavor, however, is not typical. Chocolate milk, cherries, honey and espresso make this a slightly fruity Imperial Stout. The slight tartness of the cherries, followed by sweet dark cherry juice and honey compliment the standard flavor profile. A bit of warm alcohol emerges at the swallow but not as much as the 11% ABV would lead you to believe. This Imperial Stout is suitable for drinking right away, which is rare. A bit of age might improve the complexity and hide the alcohol, but I fear it might also subdue the cherry flavor. Definitely an enjoyable stout and a departure from the norm. 4.2 mugs. Boulevard's Sixth Glass Quadruple ale gets its name from the Hans Christian Anderson's 'Ole the Tower-Keeper'. Ole is a hermit and lives in an old church tower. He spends his time reading and thinking about things, but seldom spends time with others. Three of his once-yearly visits with the narrator are recounted in the story. The second of these three visits is the inspiration for the Boulevard Quad. On this visit to Ole, the tower-keeper, we learn about New Year's toasts and what happens as the number of drinks that a person has increases. At the first drink you are still capable of being a healthy, responsible person. At the second, you are growing more confident. The third drink and beyond, you are becoming more and more evil. As the story says, it's the devil that's in the sixth glass. 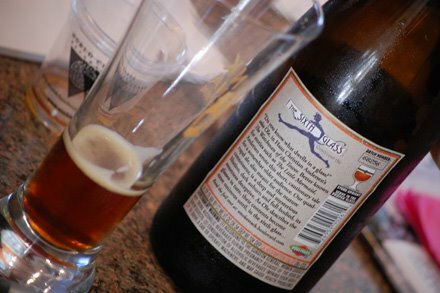 This 10.5% Belgian style quadruple Ale pours orangish-brown with a tan/yellow head. The nose starts as oranges with a bit of smoke but then gives way to a more banana aroma. The alcohol flavor that you might expect in such a high octane beer does not show itself. Overall, this beer is drinkable and balanced but if I'm going to be drinking a quad, I might choose something with a bit thicker mouthfeel. 2.95 mugs. I suspect this is the kind of thing that would happen if you had glass upon glass of the Quadruple from Boulevard. The name of this beer, Long Strange Tripel, is a reference to both The Grateful Dead and Trip Hogue -- one of the original employees of Boulevard Brewing and a huge fan of the Dead -- so it only seems right to review this beer through copious references to Grateful Dead songs. It Must Have Been The Roses, or maybe some spring flowers that we noticed in the nose of this beer. Very inviting, with a bit of Sugaree Belgian candi sugar. I decided to dive right in. With the Eyes of the World on me, or at least the room, I rolled the beer Around and Around my Tastebuds, trying to discern all the flavors. To be expected, I tasted banana with some Help On The Way from a little caramel, apple and pear in the mix. Thanks to a generous dose of carbonation, it was Just A Little Light and pleasantly smooth on the mouthfeel, a very nice change of pace from some heavier, sweeter tripels. With this one beer tasted in the series, I unforuntately had to get Truckin' and left the other beers to my companions. To Boulevard, I'd say Don't Mess Up A Good Thing and Keep Your Day Job brewing this sucker. It's Easy To Love You, Long Strange Tripel. 4.3 mugs. Well that's all well and good, but quite frankly I'm not a farm worker. In fact, I left the farm behind so many years ago that I hardly remember the sweet smell of the fresh manure on a late spring day. And it makes me sad2. Unlike most (ok, none) of our readers, I've never brewed beer in a Wallonian farmhouse. But if I was going to, I might try to make myself a fizzy lemonade-looking kind of thing; maybe a couple fingers of foamy head, and a light scent to take my mind away from all that manure. Maybe I'd even make that beer smell a little bit soapy... not soapy like Zest though. Maybe a floral perfume-like "grandma-ish", soapy sort of smell. Something that reminded me of summer and sunshine, minus the sweat and hard work. When I think of Grandma (anyone's grandma, for that matter3), that's what I think of: summer and sunshine. So.. Boulevard Smokestack Saison. The grandma-inspired anti-manure beer of choice? I'm sure the folks at Boulevard wouldn't make that claim, and neither would I. While this is a fine beer - a light and tasty treat, in fact - I'm just not sure it's a style worthy of a limited special release. It's the sort of beer that's just sort of sitting there in front of you. "Hmm.. a beer," you might say. "I suppose I'll drink it." 1Wikipedia is an old man who spends most of his days obsessively changing the oil in his pickup truck. 3This is a complete lie. Your grandma is effin' scary. And so... What of the home brewing? Is that the free beginners copy of Zymurgy I spy in that picture? Man, homebrewers are really into homebrewing, aren't they? Rod and Jess were/are working on a Dogfish India Brown Ale clone - from Rod's twitter:"just transferred the dogfish head IBA clone into the secondary. It's already 7.5% ABV. We need a name for this, it's going to be epic." Jess, I cannot believe you've never been into a trailer park. Seriously? That's what I said, Kelly. I also offered to take her on a tour of my hometown, where I can show her not just one, but TWO trailers currently in my family's possession. I think that's the issue on "green" brewing. 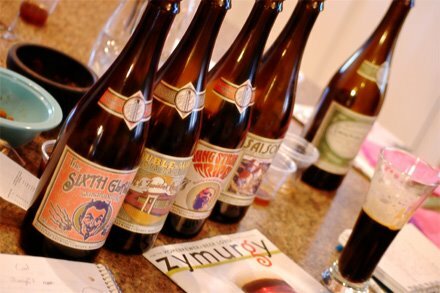 We had a few different ones out to try to explain why we like Zymurgy. Turns out if you don't already homebrew, the recipes are sort of a hard sell.